Tickets available here beginning 1/17 at 9 a.m. 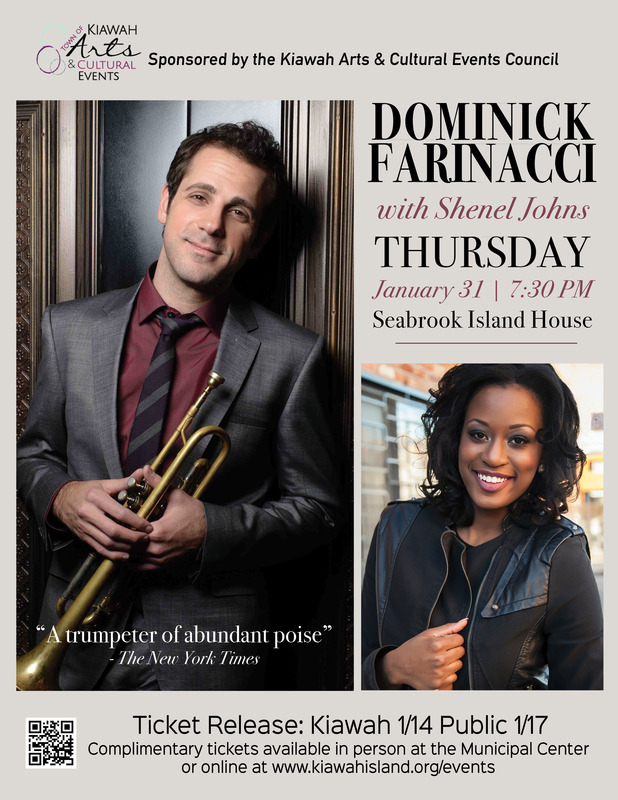 Hailed as “a trumpeter of abundant poise” in The New York Times, Dominick Farinacci will bring his soulful jazz to South Carolina with rising star vocalist Shenel Johns. The two talents share a connection from around the world – Jazz at Lincoln Center Qatar. Farinacci spent two years at the Doha venue after being named the first Global Ambassador for Jazz at Lincoln Center, and Johns completed her two year residency there in 2016. Among numerous accolades, Farinacci was one of only four trumpeters in the world to be selected as the inaugural students in the Juilliard School’s first jazz curriculum. His latest album Short Stories was produced by four-time GRAMMY® award winner, Tommy Lipuma. Johns is a graduate of the Jackie McLean Institute at the Hartt School of Music and studied performance with such jazz legends as Rene McLean, Jimmy Greene, and Nat Reeves.